Equality is arguably the most misused and overused word. Equality assumes that everyone starts from the same place with the same barriers and requires the same help or supports; therefore, denotes that everyone should be treated equally. But treating everyone equally is not always fair. How often, if ever, have you met a person who is exactly like you? Who needs exactly what you need? Who wants exactly what you want? Who faces the same exact issues you face in the same exact way, requiring the same remedy? Twins can’t even boast that type of equality, so imagine applying that concept to whole groups of people. It may appear that striving towards equality is fair – but ask yourself this – is it equitable? Providing a single solution to everyone can be problematic. The same goes for not providing a solution to some because others don’t need it. Let’s imagine we want to fix a problem. In the problem you have found that some people have no shoes. How would solving this dilemma look using equality verses equity? Equality 101: To be fair, let’s give everyone a pair of shoes. And to make it equal, we will give everyone,, regardless of whether they need it or not,the same style and size shoes, because that is equality. While you help those who happen to wear that shoe size, there are far more who still need shoes. In addition, resources have now been wasted producing a product that many cannot use. Also, now some people have a surplus of shoes (while others still have none) because equality yields that everyone gets shoes. Not to mention the neglect that follows because there is an assumption that the issue has been resolved. But equality doesn’t solve the issue and may even create other problems. So now that we have examined what giving shoes using “equality” looks like, let’s take a look at giving shoes through the “equity” lens. Equity 101: By finding out the barriers hindering people from getting shoes, the sizes each person needs and providing the correct shoe size to everyone in need, equity ensures that everyone in need are provided with the right shoe and fit. 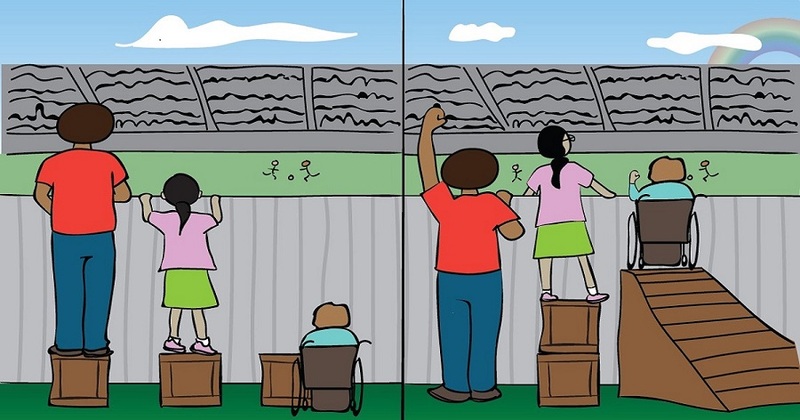 We’ve all seen the equality vs. equity image, right? How does this concept apply to life? How are we approaching personal and societal issues? How does it shape our approach to the causes we stand behind, such as wealth gaps, women rights, the dismantling of racism? How are we applying this to the overall inequities we face and uphold? Striving for the equality of women across all fields has its drawbacks. It fundamentally leaves no room for issues which are particular to women. Furthermore, it makes the standards of what women need and want set by standards meant for men; as opposed to just what is necessary for us as women. Equality doesn’t address specific barriers, the similarities as well as the differences of what women need. You need an example? Here’s one: having tampons or pads in a women’s restrooms is equity, not equality. Equality would dictate that both men and women’s restrooms have pads and tampons, or none at all; or that both women and men’s restrooms have urinals, or none at all. In feminism, we see a push for equality that assumes all women are White women. We’re not. We are varied, as are our obstacles and should be addressed accordingly. This equality push also assumes that everything men have women want. We don’t. For example, we don’t want urinals. However, making feminine hygiene products more accessible and not taxing them would be great. Equality strips away the needs, the context and parts of the reality and provides a blanket “solution.” It discounts that some need more resources just to get to the starting line. Before I go on, equality has its place. Paying a woman, or a person of color, less for the same position occupied by a man who gets paid more is wrong. This is a prime example of where the equal pay argument should most certainly be made. However, equity has a more relevant place that leads to equal pay and many other benefits. Equity is often neglected, despite being more actionable and beneficial than equality. Even when seeking equal pay, equity must be employed. The data that shows us that women are paid less than men or that men of color are paid less than White men (with some exceptions with regards to Asian communities) comes from an equity lens. Otherwise, the data would make no mention of race, gender, age, place etc. It would simply show employee A makes a certain salary and employee B makes a higher salary for the same position. There would be no context, it would leave people to assume that the discrepancy is due to the quality of work or education, which isn’t necessarily true. Without equity, patterns of discrimination are difficult to see. We wouldn’t be able to identify that employee B is being paid more as a man or a White person and employee A is being paid less as a woman or a person of color for the same position. Striving for racial equality assumes that all races start at the same place with the same privileges, history, and problems. It assumes that all people face the same barriers. They don’t. Equality also erases that some races face barriers systemically specific to their race. Yes, you did work hard for everything you have, but those who have less have worked just as hard with much less success. The fact is that not everyone has equal opportunity. Opportunities and resources are actively and systemically taken away from certain people. Many people work hard. In a fair society, success would be theirs – but in a systemically racist and sexist society, they are just surviving, if that. The same goes for class you were born into. While being born into a wealthy home affords an advantage not given to everyone, it has nothing to do with work ethic. Obviously, we should all continue to work hard and achieve success (whatever you believe success looks like.) But the reality is that some must take ten steps to get to the same place others only took two. This idea is often recognized when it comes to class and wealth, but it is also applicable to race, gender, ability etc. We all have obstacles but all our obstacles are not the same. The problem of man-made, institutional hurdles that are placed in front of some and not others based on race, gender, class must be addressed. Equity, not equality, will get us there. Equity forces us to acknowledge the discrepancies in the first place; especially in a country where gender, class, ability etc. is racialized. For example, according to Anne E. Casey’s 2017 Race for Results report, when we look at opportunities available to our children, what we see is that while no one particular racial group has children meeting all milestones; people of color, specifically African-American, American-Indian and Latino children face the greatest hardships in seeking opportunity. Also, African-American children have a composite index score that placed them further from opportunity than kids of other races and ethnicities. The results from that study showed negatively, not because of capability, ambition or willingness to succeed, but because of inequity; because of intentional systemic structures and a culture that some are meant to succeed, while others are not. Being a woman, being disabled or being poor are all identities in which one is discriminated against. If you are either or all those things, as well as being Black or a person of color, then your hardships are increased. Racial equity isn’t about giving marginalized groups what White people have. It’s about achieving a condition in which racial identity no longer predicts, in a statistical sense, how one fares. Equity acknowledges the problems particular to individuals and marginalized groups. By doing this, some may say builds a divide. It doesn’t. Remember, we can’t fix problems we don’t acknowledge exist. Actively loving, growing, healing and seeking remedies is not divisive – it’s unifying. Equity is the lens that should inform our decisions. Our plan of action needs to be focused on equity, not equality. I don’t mean to make equality sound like a dirty word, only to express its limitations. We just have to remember that pursuing equality does not ways lead to what is fair – maybe even furthering injustice. Treating everyone the same, when literally no one is the same is a recipe for disaster. However, pursuing equity identifies the problems specific to people/groups and addresses it accordingly. It looks at the specific traits and life of a person and requires an empathetic approach in order to know and help others. In the pursuit of justice, equality falls short and perpetuates the same cycle of privilege of those who have what they need verses those who do not have. Whereas, equity steps up to the plate as the state, quality or ideal of being just, impartial and fair. This is a wonderful, accessible way to introduce the concept of structural violence! I’m saving this article to share when I try to explain structural violence to others. This idea of equity is something many conservatives and Republicans just can’t understand–or care about. Your article makes it very clear.